I had these for the first time about 14 years ago at my high school sweethearts house. I can't remember if she or her mother made them to snack on, I just remember them being really good. The version of them they made were actually full of ground ginger. 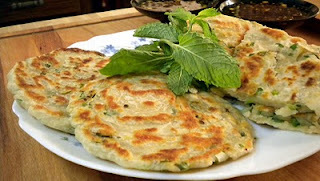 I decided to make mine a little more like the classic Scallion Pancakes and make an Apricot ginger sauce to dip them in. I was very worried this sauce would come out horrible because I was running short on time so I just jotted down a quick idea and asked Zo to throw it together. As luck would have it what I jotted down was better than I could've imagined! I've tried my best to make the instructions as clear as possible, so if you have any problems email me! If I figure out a better way to explain what to do to the dough I will update this post! Enjoy! Cut the long jelly roll tube into four even pieces. Gently squeeze each of the smaller rollers so that the stick together and you will be able to work with them. Stretch each individual roll to about two and a half times its length. After stretching all the rolls, give each one 3-4 full twists to make them into ropes. Take each twisted rope and tightly coil into a circle. Flatten out each coil by hand into a 1/4 inch thick pancake shape. Heat a nonstick skillet over medium to medium high heat. Whisk together oils once more and lightly brush both sides of each pancake. Cook pancakes in heated skillet for 3-4 minutes per side or until both sides are golden brown. Cut into wedges and serve warm with dipping sauce. Enjoy!